Pandas are an endangered species for sure and these animals have proven themselves to be notoriously difficult to thrive in artificial conditions, although there has been some success stories so far. In fact, I’m not too sure as to the kind of ecological benefits these pandas offer other than to munch on bamboo, which is – believe it or not, a kind of grass. Well, if you happen to have an interest in all things panda, then you might want to check out this £12.95 Sleeping Panda Mug which so happens to be a heat sensitive mug. 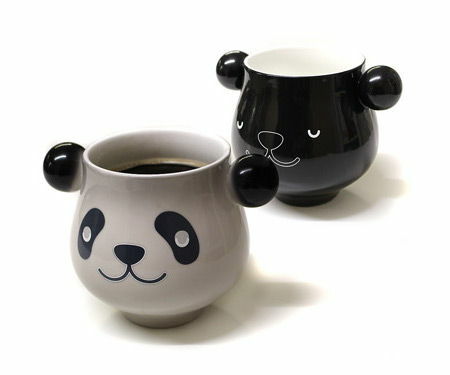 In other words, each time you pour your favorite hot beverage inside, the color on the outside would change – where a sleeping panda would then end up awake, all through the magic of a hot cup of coffee (or tea, or hot chocolate – or even hot water!). Apart from that, there are quirky handles that would make this to be a wonderful gift.